*note: I made this again and swapped in some new photos on 12/21/10. This time, I did it with a different crust, which was also great. 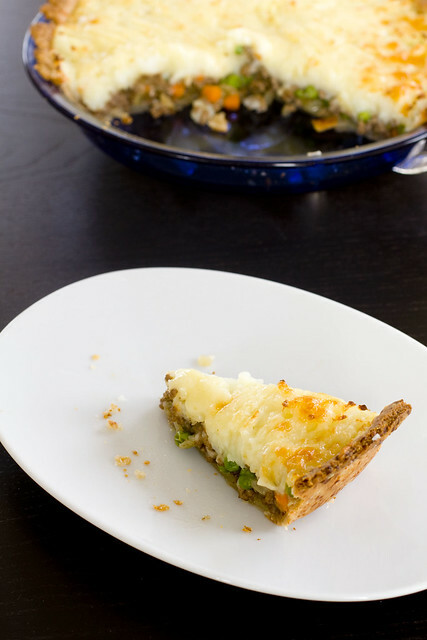 You can use the original, a good classic crust, or the cheddar crust, given at the bottom. 1. Combine flour and salt in a large bowl. Cut in butter and shortening until it looks coarse and crumbly. Sprinkle ice water while tossing together with a fork. Form a ball and wrap in plastic wrap. Refrigerate for at least 30 minutes (proceed to make the rest). 2. Preheat oven to 375 degrees F. Simmer potatoes in a small pot with salted water until fork tender (how long will depend on how big you cut the pieces). 3. Strain potatoes, and return to the same pot. Mash and mix in buttermilk and butter. Season to taste. Remove from heat and set aside. 4. In a large skillet, heat vegetable oil on medium heat. Add onions and carrots, stir around until softened, about 3 minutes. Crumble beef with your hand and spread across the pan. Stir until browned. 5. Add beef broth, Worcestershire, and dried oregano. Stir around until there is only a thin layer of liquid left on the bottom. Sprinkle the flour on and stir in (it will absorbs the rest of the liquid). Stir in peas. Season to taste. Remove from heat and set aside. 6. Roll out dough and lay into a 9″ pie plate. 7. Spoon in meat mixture. 8. 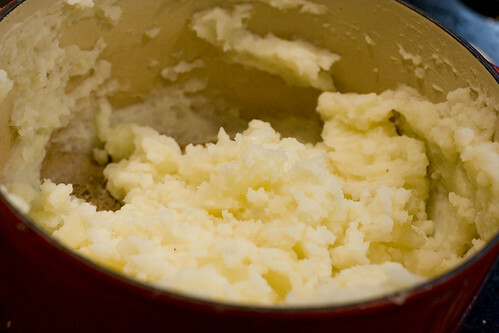 Spread mashed potatoes on top of meat mixture. Scratch with a fork to make it bumpy. 9. Bake for 22 minutes. Sprinkle cheddar on top. Bake for another 8 minutes. Serve immediately. Blend flour and salt in processor. Add shortening and butter and cut in using several on/off turns. Add cheese and pulse until it resemble small peas. With machine running, gradually blend in enough water (may not need all) until soft moist clumps form. Gather dough into ball; flatten into disk. Wrap in plastic and chill at least 2 hours and up to 2 days. posted by jessica	at 08:31 AM	Filed under American, Recipes. You can follow any responses to this entry through the RSS 2.0 feed. Both comments and pings are currently closed. Yum! I absolutely love Shepard’s pie. Even better with a crust! I just ruined my keyboard drooling on it! This gets made tonight. A classic defined. When does your Bistro open? Jessica, could you also blind bake the crust before adding fillings? Or would that change the texture you are going for? The crust is always the best part of a pie–sweet or savory! Never leave home without it. Jessica, I’ve never seen a Shepherd’s Pie with a crust. Nor have I ever questioned why it was called a “pie” in the first place. And, in the second place, all shepherd pies ought to look as good as yours. I’m married to a guy who would absolutely love this, and so would I. If I get ahold of some lamb and have the opportunity to try this, though, I’ll give it a shot. Liverpool68, you could try blind baking the crust but it’s not necessary and just adds more work. Let me know how yours turns out either way. Marysol, let me know if you make it for your hubby. Jittero, I figured I was breaking rules, adding crust and cheese. “Real” was more of a joke. I’ve never thought of using cheese though–thanks for that!! That shepherds pie look so good! I really like the idea of topping it with cheese! look at that cheese. just look at it. your take on shepherd’s pie is the best i’ve seen. Yvo, you don’t like crust? what?!? 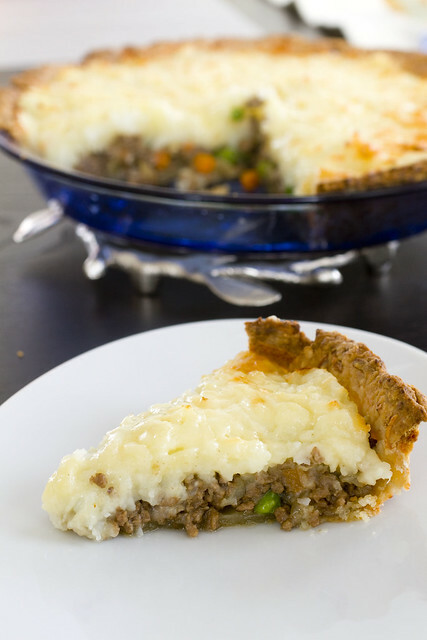 I love shepard pie,but i never seen it with cheese on top. 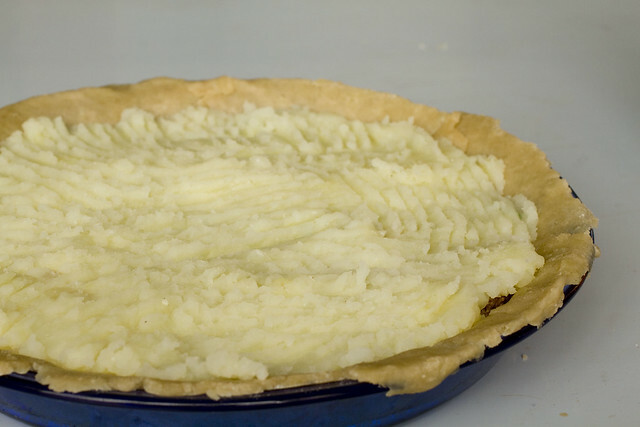 I wanted to make a sheperd’s pie last night with a crust, but I couldnt find any recipe that included one, until I came across yours! I was about to give up and just forgoe the crust until I came across this recipe. It turned out so good. Thank you for posting this. I thought maybe it was just me. 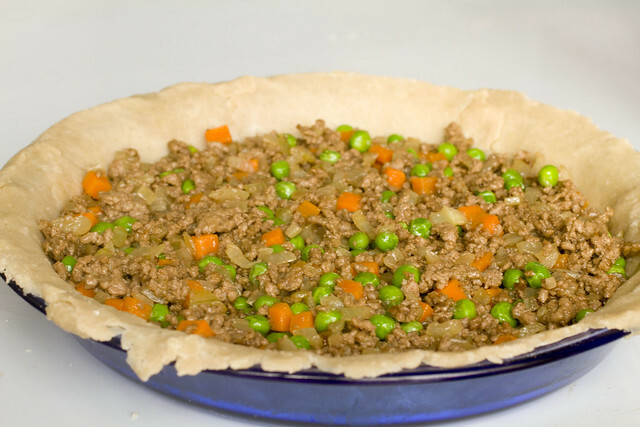 This pie is delicious, whatever you want to call it, shepherd’s, cottage, hamburger… it’s just called GOOD! DON’T FORGET THE HP SAUCE!!!! I’m satisfied to search out so many useful information right here in the post, we want work out more strategies in this regard, thank you for sharing.